Transport your diners’ taste buds to Thailand with this authentic mango stick rice recipe. Featuring CARTE D’Or Mango Pudding and Vanilla Flan Mix, this treat is sure to hit all the sweet, silky and creamy spots your diners could ever want in a dessert. Combine coconut milk, coconut water, milk, cream, and salt. Bring to a boil. Slowly dissolve flan mix in the milk mixture while stirring continuously. Portion and pour to fill ½ of each glass. Wash the glutinous rice and soak in water overnight. Steam the glutinuous rice with pandan leaf for 15 minutes. Remove from steamer and mix evenly with coconut milk, coconut water, salt and caster sugar. Return to the steamer and steam for another 30 minutes. Reserve in steamer until ready to use. Boil coconut water and milk in a pot. Stir in mango pudding mix gradually until dissolved. Pour into square molds and let set in fridge. When pudding has set, unmold and cut into cubes. Layer 1 cm of sticky rice on top of each individual cups filled with the coconut flan mix. 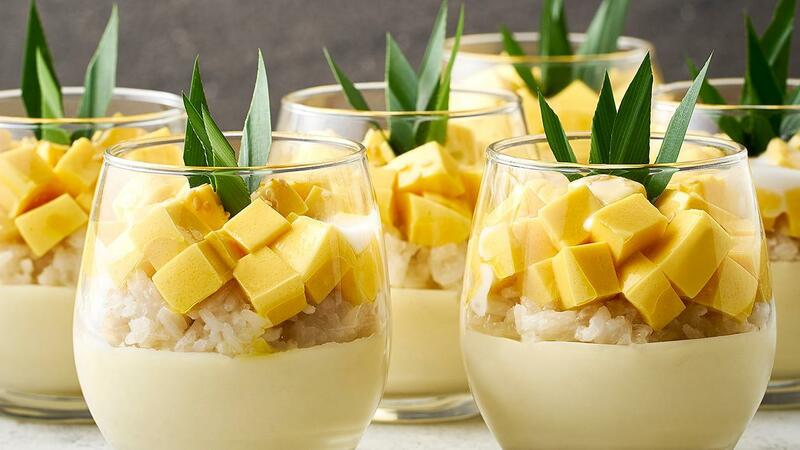 Top with mango pudding cubes. Decorate with some toasted sesame seeds.